Address: 171 Ben Yehuda st., 29 Rothschild Blvd. Why are all restaurants meant only for lunch and dinner? 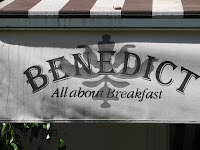 So Benedict tries to answer this question by providing a new concept: breakfast restaurant. They have around 10 rich breakfast sets which vary from each other, but they are all good. For a lighter breakfast you can have muesli, sandwiches or a shakshouka. One great breakfast type, which the waiter will probably also recommend on, is the "Eggs Benedict": Two toasted brioches topped with poached eggs and Hollandaise. This New York style breakfast is delectable and the yummy pleasure will linger on for days. 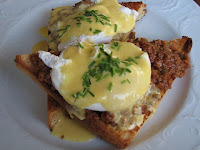 The best of this type is the "Florentin" - served with creamy spinach sauce, or the "Benedict Joe" - served with sweet-savory minced-meat topping. Along with the breakfast you get a free drink, and a basket of warm buns with spreads which can be refilled all the time. To the breakfast you can add a lot: cheeses, bacon, sausages, spreads and etc., so you can create your own special breakfast. Although just serving breakfasts, the place is open 24/7, and as usual for Tel Aviv it is quite full on Friday and Saturday lunch time and you'll have to queue up. Ben Yehuda 171 - Northern part of Ben Yehuda, next to the intersection with Jabotinsky st.
Rothschild 29 - At the beginning of Rothschild, next to intersection with Allenby.